When it comes to non-Cuban cigars, living in Europe, and particularly in the UK, means ending up with late access -and many times none at all- to many acclaimed cigars that are coming out in the US. There are many BOTL here in the UK that would never swap the ready availability of Habanos cigars for the variety of brands ans smokes our fellow cigar lovers across the ocean have access to. I am not one of them; although I love Cuban cigars it is the variety of cigars available that intrigues me. Luckily today there are more and more Nicaraguan, Dominican and Honduran smokes sold in Europe (Germany seems for example a lot better off than the UK in that regards)… plus there are always ways if you search (not even that) hard enough. If like me you follow many cigar blogs from the US regularly the NUB brand won’t be news for you at all. But maybe you have just started reading about cigars or you live in a pure Cuban puros world (bad pun intended), you would like a sort introduction, so here goes. NUb Cigars came to the market in 2008; they are the creation of Sam Leccia one of Oliva’s sales reps at the time. His idea was to make a cigar that would not need a warming period once lit up, but instead hit te sweet spot straightaway. After some trials Leccia found out that a combination of large ring gauge and short cigar produced the best solution. He pitched the idea to the Oliva family who decided to produce the line. 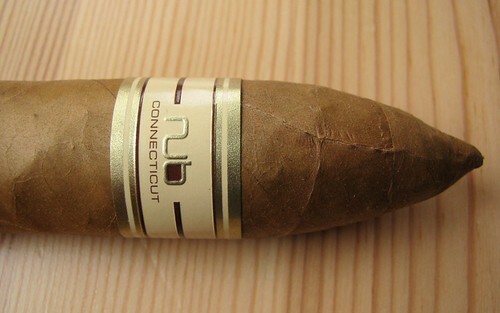 The NUb line originally was made up of three ranges: a Connecticut shade, Cameroon and Nicaraguan Habano-seed wrapper. These have become available for sale in the UK in the second half of 2009. There is also a Maduro version now, but this seemsit is not available in the UK. When these cigars came on the market there were immediately great reviews from the on-line community, plus a lot of very clever marketing. I must admit I was doubtful to say the least. The idea behind the cigar sounded like a bit of a gimmick aiming to be different for the sake of it more than anything else. Even when these came out in Europe I didn’t exactly rush to get some, yet once more and more of my friends raved about them my curiosity grew till I finally decided to grab a sampler pack… then a few more. Today I will look at the NUb Connecticut 358. Body: starts mild and slowly builds to medium bodied. When I received my NUb sampler I must admit that my first thought was that these don’t look like cigars, they look like some cool designer gadget. Both the size and the very simple but elegant band help. The cigar itself looks neatly rolled and pretty much fault free. There is a mid size veined running through the wrapper, but in my experience that is not uncommon in Connecticut shade type leaves. As expected it feels pretty much uniformly packed and heavy. As with other Connecticut shade wrapper, the pre=-smoke aroma is faintly reminiscent of hay but not much else. Overall the construction is really impressive. The draw is perfect, with just a little resistance. It produces tons of creamy smoke and the burn needs no corrections, even if it is slightly wavey. You probably have seen pictures of impressive ashes on NUb cigars around the web, some even doing the now famous NUb stand: well, the ash on this one was quite solid but didn’t get as long as I almost expected. I fought with myself a bit here, deciding if it would be better to divide this in the classic foot/middle/head sections or not. The cigar does evolve, even if it is so short, but not so much to justify splitting my tasting notes into three sections. The promise of this being a cigar that doesn’t need a warming up period certainly lives up. Straight away there is a very nice Nicaraguan spicy tobacco note and a very creamy smoke with slight hints of coffee. Towards the middle the spice goes down a bit but the taste is more complex with nice toasted and earthy/cocoa notes. I am generally not a huge fan of the last inch or so of most cigars: they tend to go too hot for my taste, but this NUb Connecticut 358 was impressive played on tasty notes with white pepper spice and straight black coffee at first, then wood, caramel and an unusual sweet spice note towards the end that reminded me of green cardamom. If I say that I am sorry I waited so long to try a NUb, you can imagine I am pretty happy about these, and as a matter of fact I scored the Connecticut 358 a round 90. It is a well constructed cigar and even though it doesn’t have a great evolution it is still interesting enough to keep my attention throughout. It is certainly something I would pick at many different times during the day. Would I buy a box? At US prices definitely, at German prices maybe, but at the ridiculous UK ones… no. For almost 10£ a cigar there is too much competition out there and at these prices non-Cuban cigars stand little or no chance of entering the UK market successfully. I had most of this entry written yesterday, but before I published it, I had a chance to try the NUb Connecticut 464T too. Flavourwise, it was pretty similar to the 358 till the last inch, just a tad more tasty notes from the start and more wood from the midpoint. Unfortunately it missed the great finish the 358 had and became very hot, although just before that some delicious vanilla and buttery notes had appeared. On the plus side, this had fantastic long ash and I almost managed to make a NUb stand. Because of the disappointing last part my score is a little lower for this than the 358, still a decent 87. 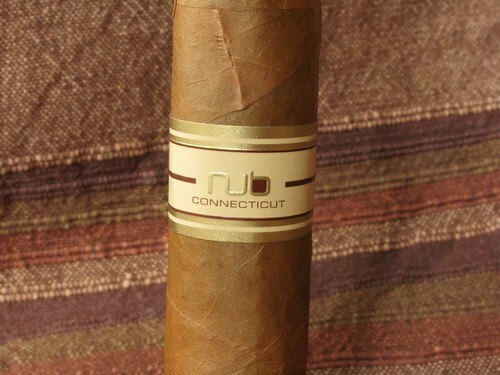 This entry was posted in Cigar Reviews, Connecticut shade, Nicaraguan and tagged 358, 464T, Cigar Review, Connecticut shade, Nicaraguan cigars, NUB, Oliva, Sam Leccia. Bookmark the permalink. Awesome review!! atm, I’m enjoying a Connecticut 460, and for the most part, spot on in describing how great of a smoke this is. I do find that about midway through the 460 it became an earthy, spicy flavor, but quickly went back to the creamy roasted coffee taste. Awesome cigar either way, though. too bad prices are so outrageous on the other side of the pond.